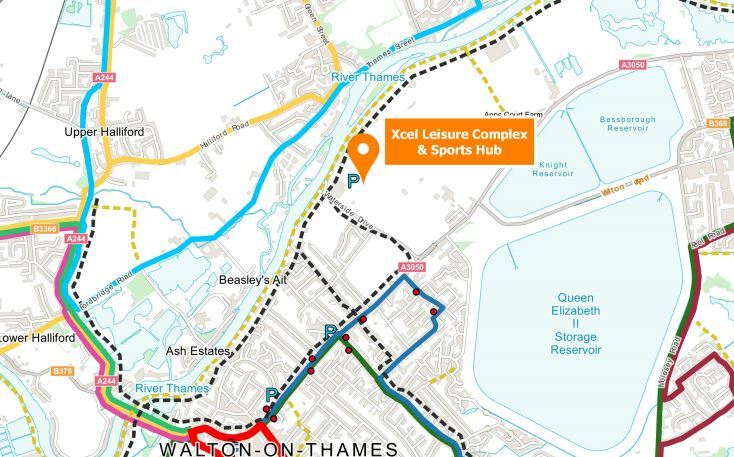 The Waterside Drive Sports Hub athletics arena is located to the rear of the Xcel Leisure complex. Take the signposted exit from Waterside Drive closest to the town, before you reach the Xcel car park. Click here for more information on Elmbridge Council’s Bus & Bike loyalty scheme. The athletics stadium is located approximately 2 miles from the closest rail station, which is Hersham. The 564 bus runs hourly from the station to the XCel Leisure Centre, and takes approximately 40mins. The last bus outbound on this route is just before 6pm. It is just over a mile from the Town Centre to the Athletics Stadium, with multiple bus routes to the town from Kingston, Heathrow, Sunbury and Esher. If in doubt, follow signs to the leisure centre! Leave the motorway at junction 10 and take the A3 towards London. At the first junction turn left onto the A245 and at the next traffic lights turn right into Seven Hills Road. Continue for approximately two miles crossing a mini roundabout and larger roundabout (follow signs to Walton). At a third roundabout, turn left. Continue to Walton Town Centre, continuing straight ahead at all junctions until you reach a traffic lighted junction at the far end of the High Street, at which you will turn right. Follow this road out of the town passing a mini roundabout and a small parade of shops. You will pass a zebra crossing which leads to a school on your right immediately before a large roundabout. Turn left on this roundabout, and take the first road to your right, which leads you to the car park. Leave the A3 at the Painshill Park junction and take the A245 towards Woking. At the traffic lights turn right into Seven Hills Road and continue as above. Cross Walton Bridge and take the left lane at the traffic lights on the south side of the bridge. The road swings round to the right. Follow the main road through Walton town centre over a traffic lighted junction and mini roundabout, passing a small parade of shops on both sides. You will pass a zebra crossing which leads to a school on your right immediately before a large roundabout. Turn left on this roundabout, and take the first road to your right, which leads you to the car park. Follow the A244 towards Walton, down Lammas Hill straight over the roundabout at the foot of the hill and along Esher Road. Continue straight on at the next roundabout past the Barley Mow and turn right at the next traffic lights. Continue straight ahead at the next traffic lights and across two mini roundabouts to Walton Town Centre. Join the one-way system, staying right to pass the Italian restaurant, then continue straight ahead onto Walton High Street. Turn right at the traffic lighted junction at the far end of the High Street. Follow this road out of the town passing a mini roundabout and a small parade of shops. You will pass a zebra crossing which leads to a school on your right immediately before a large roundabout. Turn left on this roundabout, and take the first road to your right, which leads you to the car park.